I stopped counting how many people around me complain about spending too much time on social media. I sometimes ask myself why I’m looking at my smartphone without any purpose. Yes, social media can make us lose a lot of time without bringing us that much benefits. 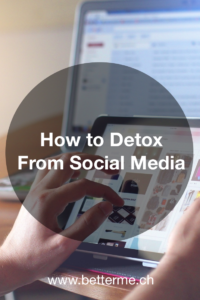 That’s why we’re going to talk about how to detox from social media ! But how do simple Internet websites make us that addicted ? A study showed that positive reactions on social media (likes, shares, comments) activated a brain area named nucleus accumbens. This area is implicated in the reward pathway and get stimulated in the same way when we are confronted, for example, with sexual or food stimuli. When the nucleus accumbens is activated, the action that triggered this activation will be positively reinforced, which will increase the probability of repeating this behaviour. Now you understand better why it’s sometimes very difficult to say “no” to this delicious brownie you like so much or to prevent you from checking your smartphone as soon as a notification pops up. The activation of the reward pathway partly explains addicting behaviours, domain in which Internet and social media are well concerned. Of course, the goal of this article is not to stop you from using social media (otherwise how would you be informed of my latest articles ? 😉 ) but to give you a few keys to reduce your many unuseful smartphone verifications. Put your smartphone on silent mode : how many times are we checking our smartphone after having felt a vibration to see that it’s the hundredth invitation to a Facebook game that we absolutely don’t care about ? Maybe you’ve already had the impression that your smartphone vibrated and see that there’s no notification… Here’s a simple way to solve this : put your phone on « silent mode » and you won’t be disturbed by the first vibration coming. Yes, you’ll probably miss a call from a friend sometimes. But really, how many times in your entire life have you received an emergency call that couldn’t wait 30 minutes ? Turn off « push » notifications : you can choose in your social media parameters to turn off « push » notifications to prevent them to pop up on your smartphone. This way, you won’t constantly be disturbed by notifications coming in and you’ll save time checking them all at the same time once or twice a day. Here’s another advantage : your battery will last way longer ! Set specific social media time : in a way to channel your desire to go on social media, set specific hours during your day on which you can check them. I personally check my notifications when I wake up, at noon and before going to bed, which prevents me to take my smartphone out 20 times a day to see my news one by one. What will you gain from being less on social media ? You’ll save time : instead of checking your smartphone every time you’re bored, while waiting for your bus or for your meal to heat up, you’ll learn to replace it with other activities. Why wouldn’t you take advantage of your bus ride to read a book ? Or taking time to think about future projects ? You’ll be more productive : when you regularly check your smartphone, this often last only a few seconds. But the problem isn’t the time you spend every time you check it, the problem is that it constantly interrupts you in what you’re doing. At work or at home, you’ll take way more time to do your tasks if you always have to interrupt and start again a few seconds later. Let your smartphone alone and you’ll see your efficiency increase drastically, which will free you time for leisure for example. You’ll be more present : being passive scrolling through social media prevents you from thinking freely. Stop watching your phone and enjoy the world around you. Let you time to think. Observe people around you. This will stimulate your creativity and will allow you to be more present in the moment and with yourself. Long story short, simple gestures and little changes in your daily routine will bring you huge benefits in time, productivity and well-being. Why not giving it a shot ? On devient facilement accro… Pour ma part, j’ai un iphone avec une capacité de 5.2 GO ce qui m’a obligé à réduire mes applications en sélectionnant l’utile du futile. Je n’ai plus un seul réseau sociaux, Instagram que j’utilise plus comme une base de donnée d’idées et de créativité et non pour dialoguer. J’ai également enlevé toutes les notifications (sauf whatsapp) depuis bien longtemps. On gagne du temps et de la liberté! Merci pour ton article qui fera peut-être prendre conscience à certaines personnes de leur addiction. Merci pour ton commentaire. Chacun doit trouver l’utilisation qui lui convient, cela peut grandement varier d’une personne à l’autre. L’essentiel est de trouver jusqu’où les réseaux sociaux te sont utiles et savoir s’arrêter lorsqu’ils deviennent superflus, voire néfastes.